Samsung will reportedly announce its next-gen flagship smartphone at MWC 2014 in February next year, and the rumoured Galaxy S5 may even pack a stunning QHD, or 2K, or 2560 x 1440 display. It was already revealed that Samsung is working on these super sharp displays for its 2014 flagship, but what’s surprising is in how quickly it will be adopted: MWC is a mere two months away, indicating that Samsung is ready to blow minds – and the competition – with its Galaxy S5 smartphone. Then again, Samsung’s not the only one preparing a 2K display smartphone. 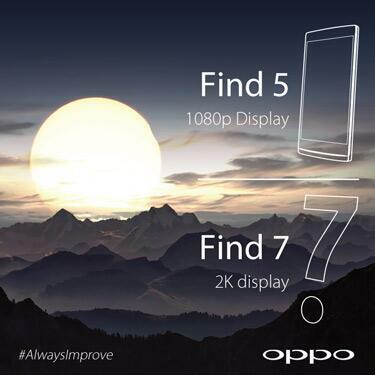 Chinese manufacturers Oppo have begun teasing its next flagship device, the Find 7. The Find 5, announced last year and vaguely made available in Malaysia in Q1 this year, was one of the first smartphones in the world to introduce a 5-inch Full HD display. With the Find 7, Oppo are reportedly ready to push this further, explicitly indicating a 2K display in an image tweeted yesterday. There’s no mention of a release date, so the race is on between the two to announce only the second 2K smartphone in the world. Yup, there already is one Android smartphone that packs a similarly pixel-dense display, though you may not have heard of it just yet. Another Chinese manufacturer, Vivo announced in October its Vivo Xplay 3S, the first-ever smartphone in the world to feature a 2560 x 1440 display. Interestingly, the smartphone is not yet available, nor has there been any official unveiling, save for this by China Mobile – though the rumours pegged that the device will be available in China by the end of this year. I guess the race is still on to be the first to hit the market, then.